My ties are ripped from pressure treated lumber... then soaked in a mix of old, used motor oil and diesel fuel. These ties have been in place since March so I can't attest to their longevity yet. 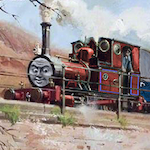 Looking very effective Dwayne The treated look though is a bit posh for the Skarloey/Talyllyn in its run down era. 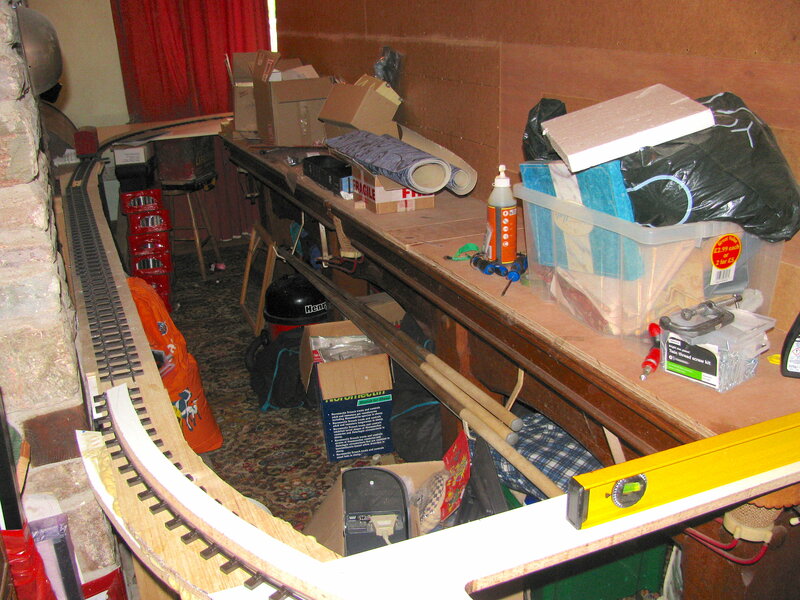 I very much assume the mix won't take on plastic sleepers but I'll keep it in mind if I do any other stretches of the SR post 50's or one of Sodor's standard gauge lines under a roof. I'm not having much luck with the vinegar method but that could be due to using a broken up Brillo pad over general wire wool. I'll try to find some proper stuff next shop but for now continuing with the black wash as it's not far off what i'm trying to emulate, will try mixing up a slight variance on some of the sanded and scratched up sleepers that have already had one treatment and see how they look by comparison. Bought three of Accucraft's Lynton & Barnstaple bogies at their open day sale the other week but they are a bit too wide for the Talyllyn's loading gauge and not surprisingly too narrow for standard. 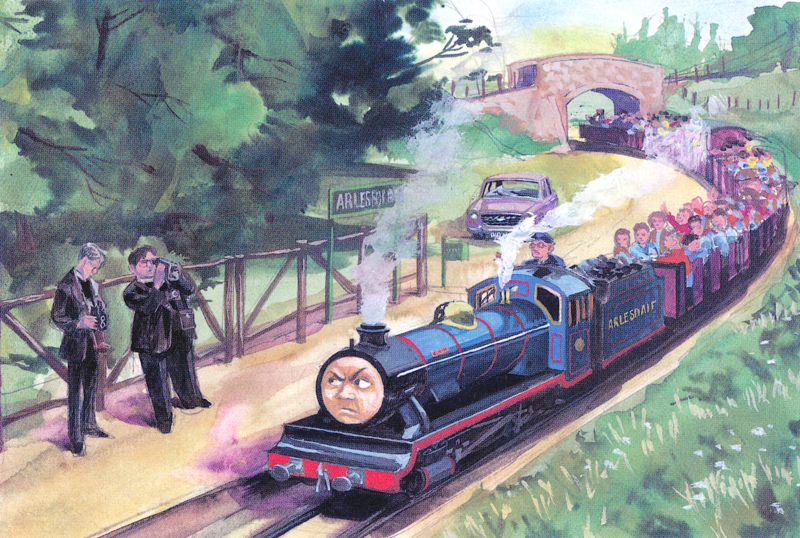 In the Thomas the Tank Engine show of old at least four of these were adapted for G1 from 16mm Tenmille? kits and with little more than added side buffers fitted in quite well, sure they would look equally suitable on several G1 layouts or even G at a push as they're only a cm narrower than Bachmann's Troublesome Trucks I've had to be more brutal with mine though as i'm only really keeping the sides and fittings. So far it's going well but i'm a little stuck on replacement bogies. Only three or so G3 freight kit accessories are available from what I can gather but they're on the pricey side and not quite what i'm after so was pondering on re-gauging some G bogies but don't know much about the various American and German products, can anyone tell me what the largest spares are available? Looking at some GWR plans if my 1:22.5 maths is right i'm looking for something with a 75mm wheelbase give or take as Slaters 3' 1" wheels/Bachmann's slightly smaller Troublesome Truck wheels look far too big to jam in the supplied Accuraft bogies which have a 65mm wheelbase (planning to reuse these for another SM32 project though as they're too good to throw away). So far it's going well but i'm a little stuck on replacement bogies. Only three or so G3 freight kit accessories are available from what I can gather but they're on the pricey side and not quite what i'm after so was pondering on re-gauging some G bogies but don't know much about the various American and German products, can anyone tell me what the largest spares are available? 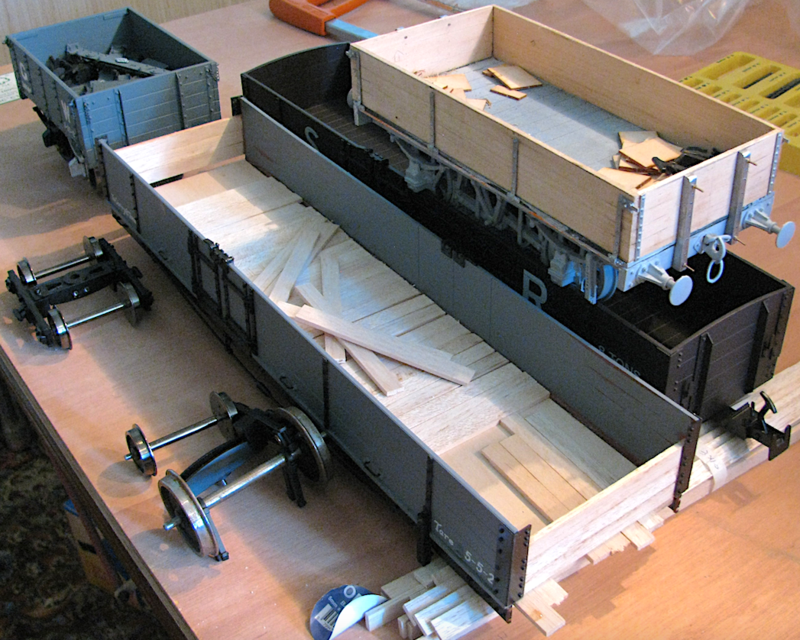 The only diamond frame bogies available separately in G scale that I know about are the LGB 'US freight trucks' part no. 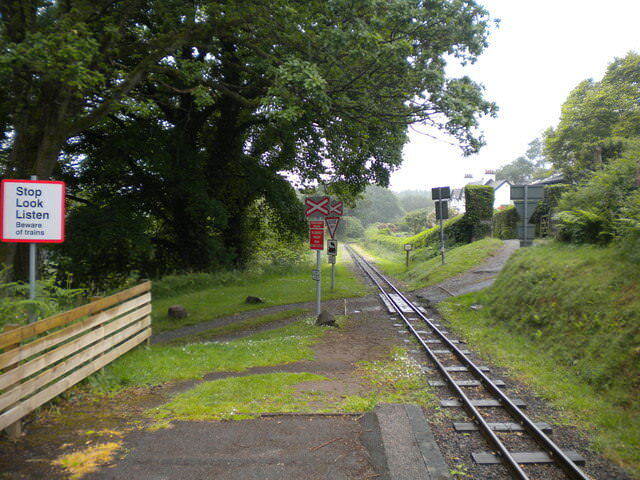 67402. Bachmann cloned those for their G scale Big Hauler range, as have Newquida, Aristocraft, etc. etc.. I use the LGB ones for my 3' gauge bogie freight stock in 1:20 scale, but they only have a 55mm wheelbase, so not much use to you. I see and it seems to be similar with the German stuff I've been eyeing up on eBay as well. Oh well, still good to know either way so thanks for the info Graeme. I'm planning to pick up a Macaw H bolster kit from Walsall Model Industries at Guildex which should be helpful for any future G3 mash ups but in the meantime a friend might be able to design some bogie sides on his Shapeways shop, shouldn't be too expensive if four are attached to one sprue and I can always scratch build the middle span section to further save on printing costs. Can't really show much more since last post but have got the floor of the second glued up now. This is part of my GRF catchup after several months in exile thanks to a duff password email system. Some thoughts on your projects as I read through your thread. Modelled next to my BS105 Oxford Blue/ultramarine Bertie to show how the Skarloey Blue differs and is achieved on said coaches. 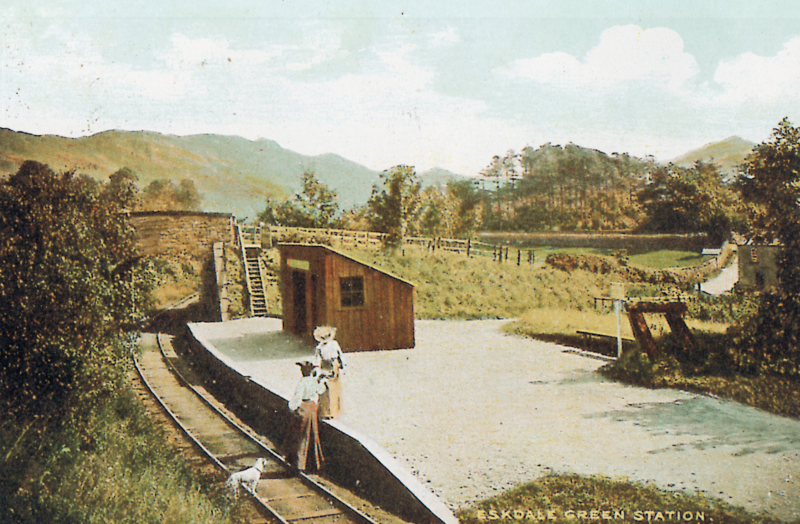 2)Skarloey coaches. You found and used a Tenmille kit - frankly, I find these to be obnoxious and ones built slowly falling apart [I had 3. Pain they were.] 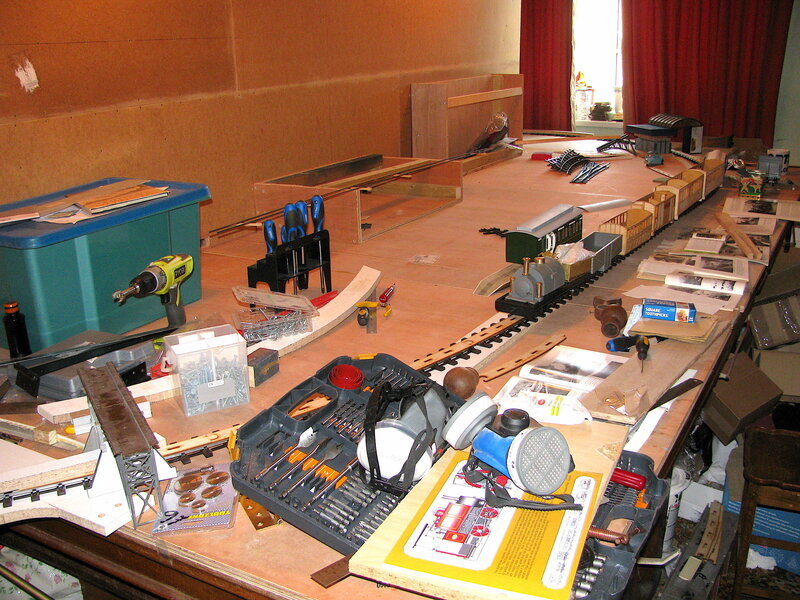 You're gaining woodkit building experience with your rather lovely looking Open coaches [Ada, Mabel etc]. Perhaps you could find some built, s/h IP Engineering or other ones ready to run that just need painting, or, dare I suggest, buying and building said kits? Suspect that with your skill too, they would be less awkward and nicer looking than Tenmille. I personally cleared out my Tenmille rake from when I was a starter and a nervous young man, to make way for the creme de la creme of Tallyho stock modelling - fully sprung, scale built, metal rooved Ron Grant coaches. 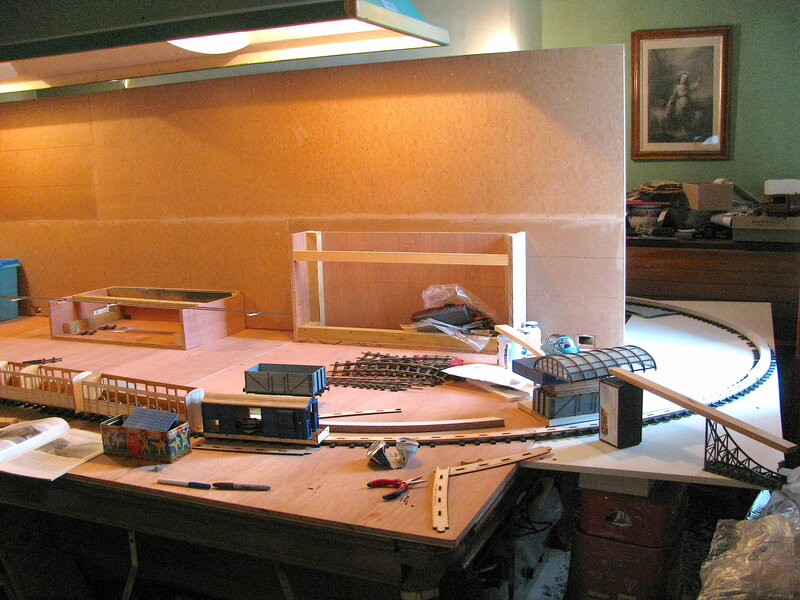 3)Yes a lot of Tenmille stuff ended up being used on Thomas filming sets. 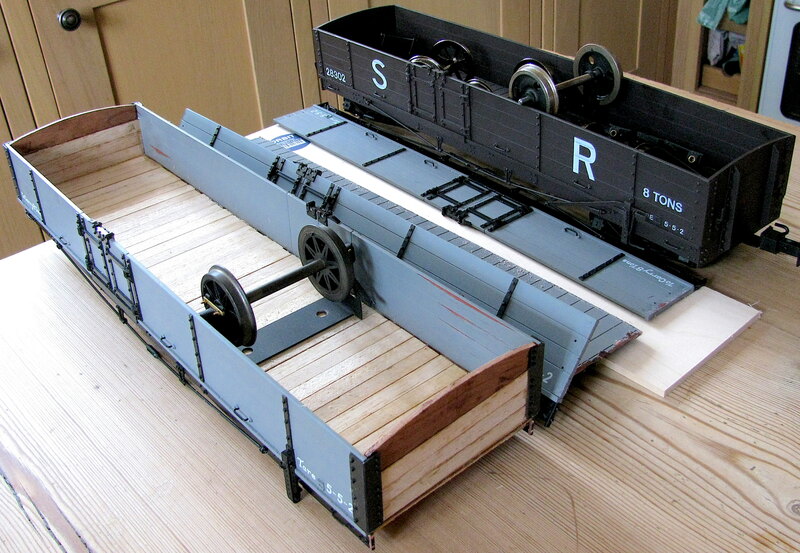 I have an associate who is on the lookout for some of these, especially the L&B wagons. He and I slowly worked out, from he studying my 16mm stuff and online material, what had happened. 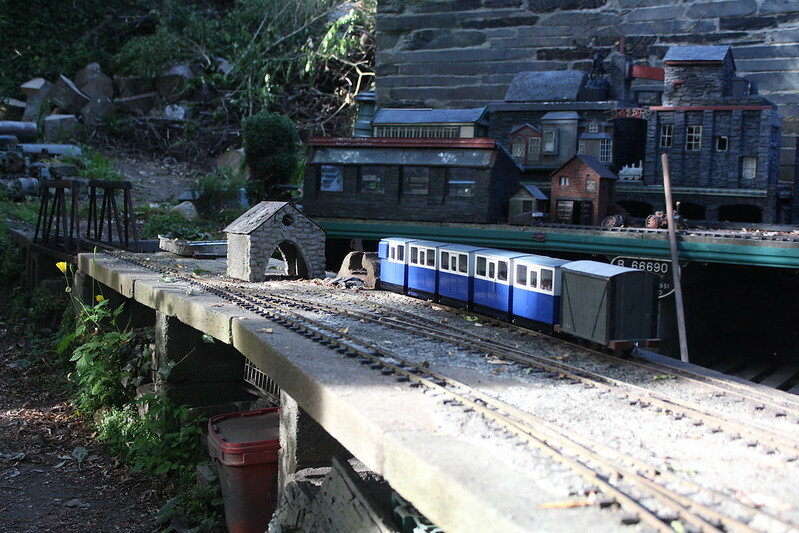 also at 0:23 onward you can see the smale coaches I painted showing off my take on SR livery! Sorry for the delay but hey up. I'm afraid I have no experience with Halfords aerosols to date but I keep hearing good things about them for the larger scales. 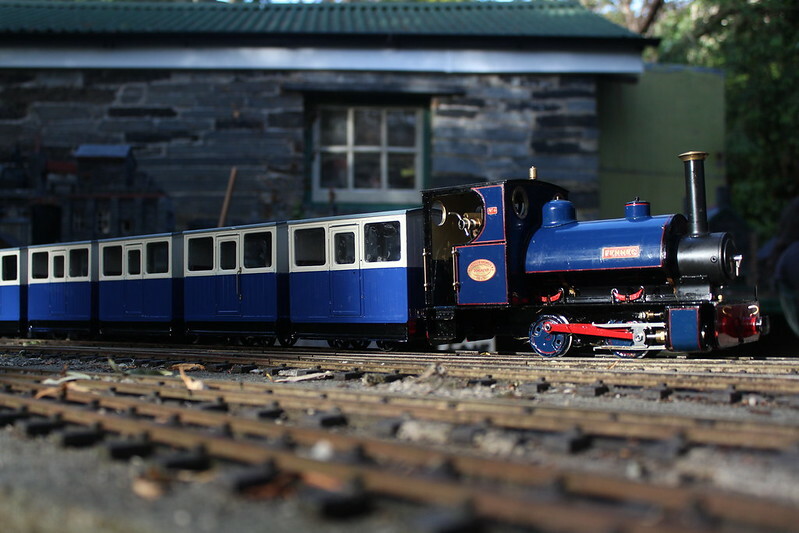 Simon Atkinson's 1:15 Douglas shown in issue 288 of 'Garden Rail' for example does look most impressive and I get they're more economical than the small Tamiya spray cans I've gotten used to in 4mm. 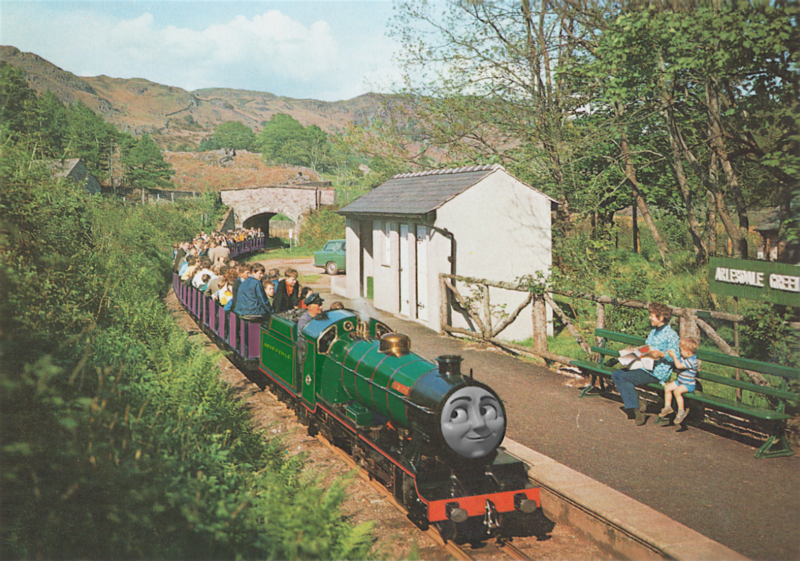 I noticed that you had a little bruha over the Skarloey shades. May I make a recommendation? I got the kit as it was cheap and I was plain curious to see how it stood up against others. I agree its age shows but so long as you aren't doing a TR style livery the lack of clean edges aren't that much of a problem and it's a fairly easy kit to assemble. Tenmille have however failed twice to send out modern replacement window overlays I asked for amongst other items so until I need something else from them it's on hold as I do not wish to use the cloudy originals. I P Engineering version is nice but despite my best efforts have failed to stop the sides bowing. In my opinion there simply isn't enough surface area for the glue to hold the tumblehome shape. I'll give another kit a try before I write them off as they don't exactly cost much but I'm intrigued to try out Brandbright's when they do get around to the Brown and Marshall stock as well as some wagons (quite a few other prototypes are in the queue is what I was told at Tywyn so nothing to add to their Lancaster for this year at least). Perfect World's coaches are nice kits to build but lack accuracy, especially for the price and i'm not so sure about Jurassic Models' as I can only find pics on this site. Would that be ThomasTankMerch? 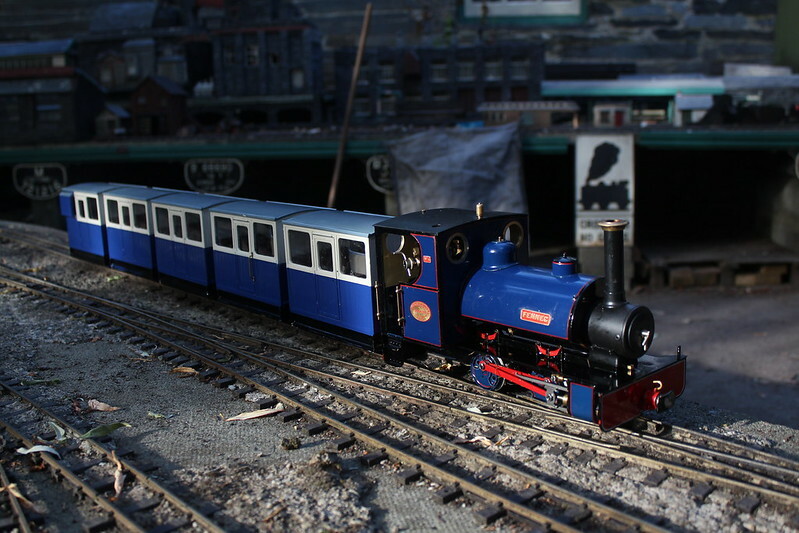 Can't find his name if it has been put up online but love what you lot have put together on Twitter and elsewhere I actually acquired a Tenmille L&B van a few months back but it fits between my standard and narrow gauge endeavours so the plan is to use it as a guide for scratch building some enlarged NWR versions, might ask Accurcraft if they can provide any spare fittings from their lovely update. 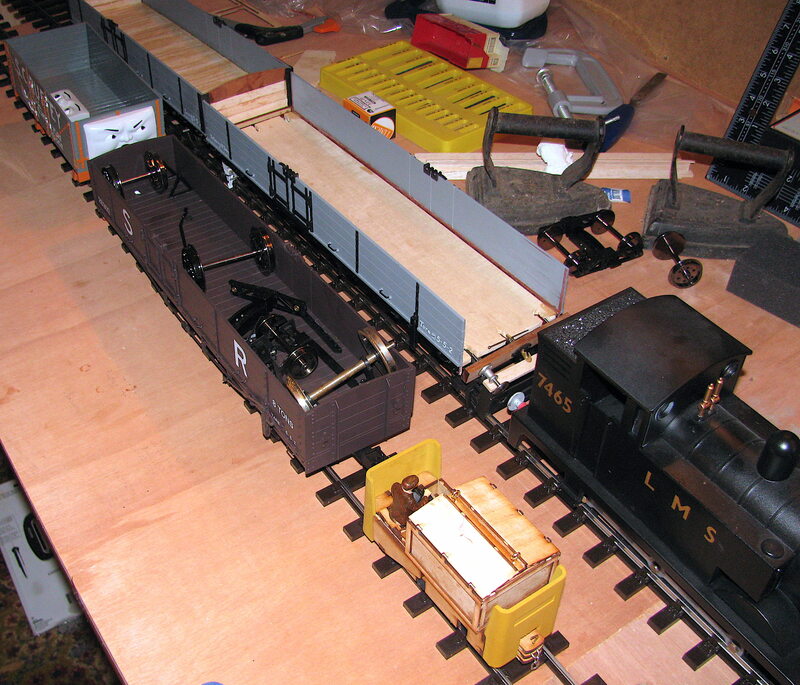 The L&B bogie wagons in the show i'm not sure were actually Tenmille as I've failed to find anything on them elsewhere. 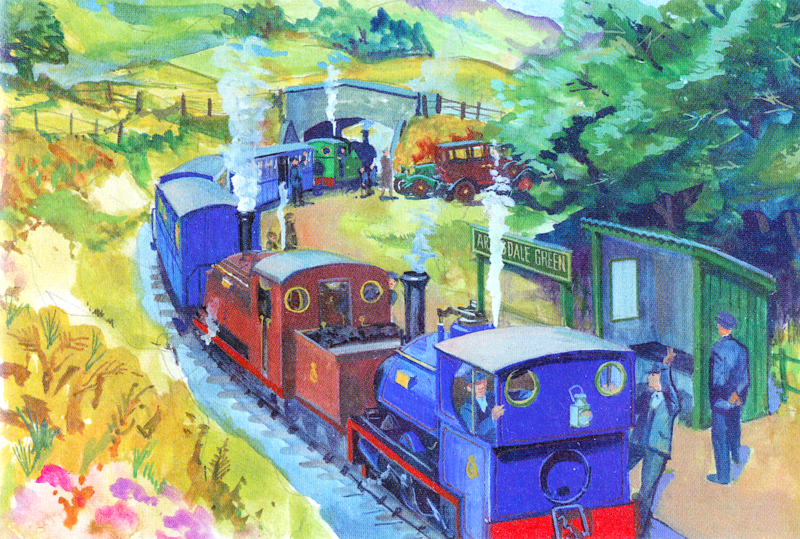 Anywho once I get a shade of red i'm happy with and some replacement bogies they'll become Wellsworth and Suddery Railway stock where their shortness in G3 scale won't show up as much compared to later NWR stuff If you have anything additional on the freelance narrow gauge wagon (the one in Percy's Predicament with Spiteful's face) or the old coaches though I would be most interested. but i'm happy to run with it. The eastern end is much truer to its inspiration but i'm still struggling where to draw the line on his condensed perspective vs the available room. The opposite U bend support will be tackled by the end of this weekend hopefully, which will complete the oval but the other put away section and back wall strait are mostly completed. 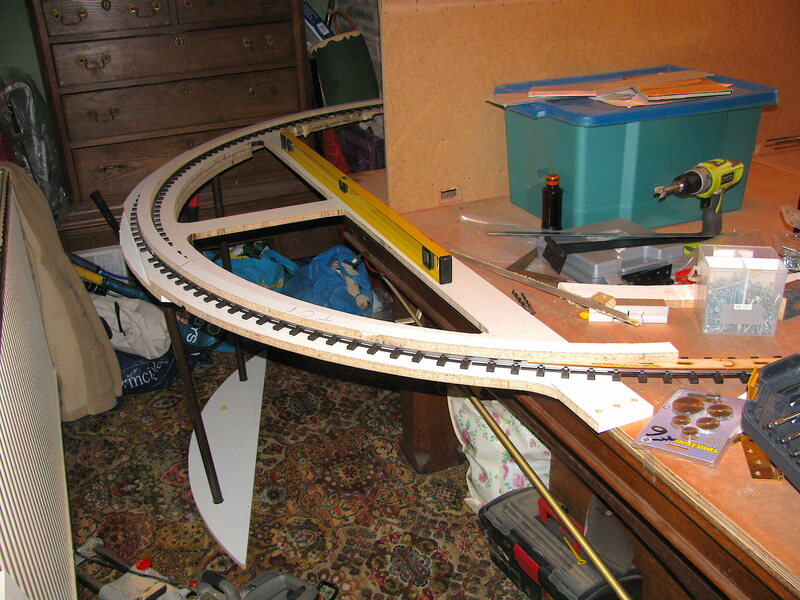 The minimum radius is 42", which while little better then PECO's set track comes to a 7' diameter. 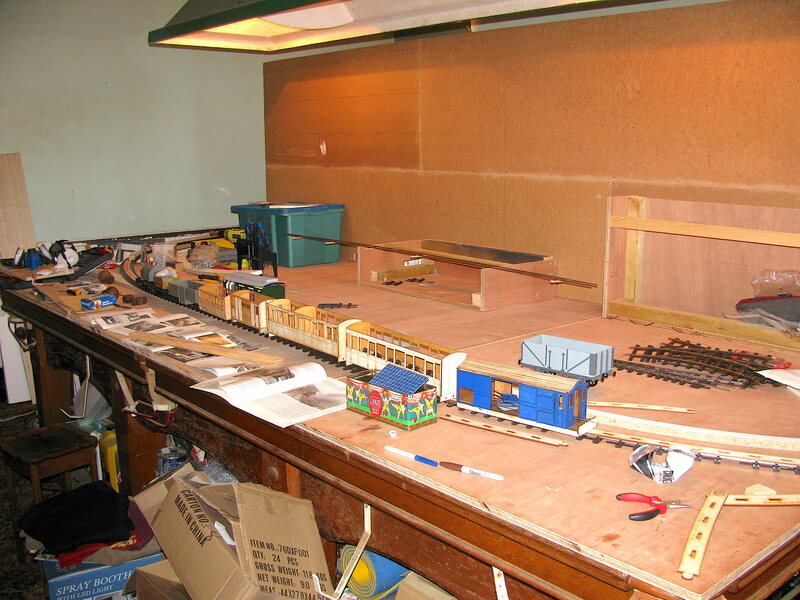 Ideally I would of gone bigger, especially as i've got side buffered stock but with the additional clearance needed, along with transitions on the scenic edges that's the limit of what I can accommodate. 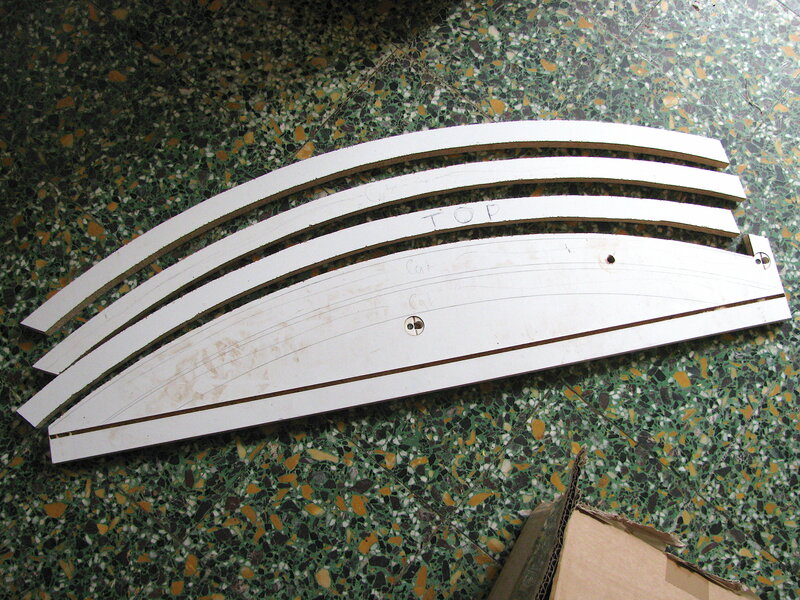 A full spread of Wood Valley Works' curve templates have come in most handy but the 4 per radius set only goes so far and the interlocking joints are flimsy enough to be affected by the track trying to straighten itself. The slack can actually be a good thing if a little short or over your x mark but rather than buy a whole bunch jigsawed a full circle's worth from the side of an old flatpack cupboard that I had saved. Not perfick I admit but good enough as the string and pencil technique wasn't practical for my usual 'moving everything about' space planning Not sure how much sense these pics are making to be honest but east to west this is the scenic area which can accommodate a certain Welsh England and four of the Ffestiniog's largest bogie designs if need be.